I've had the distinct pleasure of recording Tim Crabtree - aka Paper Beat Scissors - twice at the UMFM studio. Once in our old space and again in our new band room [you can hear the latter session here] as well as seeing him perform live. To say I was excited to hear that Crabtree had enlisted past Ear To The Sound fave Mike Feuerstack of Snailhouse to co-produce his debut full-length is an understatement - considering what I'd managed, the thought of a talent like Feuerstack drawing out the best in Crabtree seemed like a forgone conclusion. Having listened to the self-titled record that is the result of their collaboration several times over now, I can comfortably say my expectations were met. And then some. In addition to getting Feuerstack to lend his instrumental talents, Crabtree enlisted the help of Islands' Sebastian Chow (violin), Bell Orchestre/The Luyas' Pietro Amato (French horn! ), Tanya Davis and Rose Cousins (vocals). The album credits read like the line-up card for the '27 Yankees - this is a murderers' row of Canadian indie-folk artists. As great as the help is, this is still Crabtree's show and his statement. All the ornamentation in the world couldn't prop things up if the songs are incapable of standing on their own and it's clear in listening to Paper Beat Scissors that these songs have been born out of a man alone with his thoughts and his guitar; "Folds" is beautiful without the ghostly ringing guitar tones and backing vocals, and gorgeous with them layered in. Do yourself a favour and download the haunting first single, "Rest Your Bones" courtesy of Pigeon Row. The album is out March 6, 2012 and you can pre-order it on vinyl or CD via Forward Music Group. Crabtree will be heading out on a national tour to coincide with the album's release and a complete list of dates can be found here. For local readers, there will be a stop in Winnipeg on March 27th and UMFM will be presenting the show so keep it tuned to 101.5 FM for further details, and be sure to visit the official Paper Beat Scissors site for all PBS news. 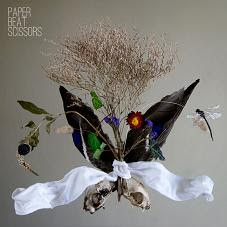 PAPER BEAT SCISSORS - Live at the Shivering Songs Festival from Mitch Fillion (southernsouls.ca) on Vimeo.